The art of hand printing from Intaglio, meaning incised or cut-in, plates has barely changed from the very earliest days of its development. To achieve a result that would satisfy both artist and engraver, the craft printer requires a tremendous depth of skill. He must assess the result that the artist and engraver or etcher planned to create, and mix inks in tone and consistency to suit the engraving, inking and wiping in a skilful manner to achieve the desired result. The production of each individual print require the same attention to detail, as the plate must be inked, wiped, hand wiped & polished after each impression has been taken. Presses used for intaglio hand printing have changed very little in the last one hundred and fifty years. Indeed some of the presses at Thomas Ross are of around that age, and in the intervening years, no reason has been found to alter the basic design, which resembles a greatly magnified clothes wringer! ....It is an individual work of art ! 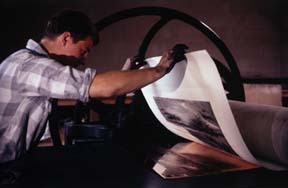 (Left) Pulling a print in the Ross workshops. The plates used to produce these fine prints are highly coveted, and, in view of the irreplaceable nature of most plates, are treated with a justified loving care. Some plates in the Thomas Ross Collection date back to the early years of the eighteenth century, they are now almost three hundred years old !. These precious plates are beautiful works of art in their own right. Many engraved plates of the works of J MW Turner, John Constable, Sir Edwin Landseer and other famous names, are a central feature of the unique Thomas Ross Collection, which, growing all the time with newly commissioned work, now extends to over 10,000 titles. The production of the finest individual prints does not end with the hand printing process. 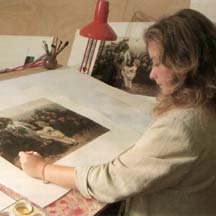 When drying of the printed etchings is complete, one of the skilled watercolourists in the Thomas Ross studios will commence work, using the best art pigments available, to hand water-colour each individual print. The results justify the effort involved, making each print a "new original" and visibly demonstrating the skill of the colourists and printers craft. The clarity of colour and depth of tone achieved is unsurpassed by other printmaking methods. the top of this page to see some fine examples of Thomas Ross prints.